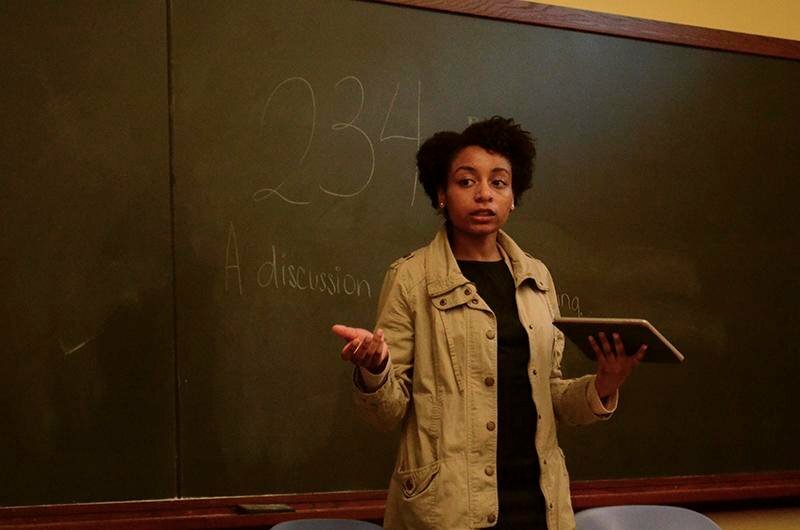 A student speaks at the Dialogue on Human Trafficking on Thursday evening in Harris Hall. Members of the Chicago Dream Center led the discussion, which was held in light of the abduction of more than 200 Nigerian girls on April 15. Representatives who work with a Chicago-based halfway house spoke at Northwestern on Thursday night in an effort to raise awareness about human trafficking, both worldwide and in the Chicago area. About a dozen people attended the discussion, sponsored by Delta Sigma Theta Sorority, Inc., as a part of the organization’s national May Week, which provides programming events that seek to spur conversation on social justice issues. During the event, two representatives from the Chicago Dream Center, based out of the New Life Covenant Church in the Humboldt Park neighborhood of Chicago, spoke about their personal experiences working with trafficking victims. Heather Morse, human trafficking outreach coordinator for the Chicago Dream Center, said the biggest issue is awareness. She explained that most of trafficking’s victims don’t even realize they have been trafficked. She described one woman in particular who had escaped from her captor, but even after the police investigation, believed she hadn’t been trafficked. “The newspaper article said (the captor) would urinate on them, whip them with chains and she still didn’t believe she was a trafficking victim,” she said. Claudia Perez, a victim of human trafficking in El Salvador, also told the story of how she began working as an advocate for the issue. After her mother died and her sister abandoned her when she was 12, Perez said she worked her way through high school, eventually graduating first in her class. Once in college, she said she needed to find an income source to earn her tuition, which led her to volunteer to grade papers for one of her professors. At her first meeting, the professor attempted to abuse her, resulting in her decision to leave college at age 19. When Perez became homeless with no money, one of her “so-called friends” offered to find her a job. This “job” led her into a prostitution ring, where her only way out of the house was if a client paid to have her for the night. Perez recalled clients entering the room and picking which woman they wanted. One night, Perez was picked. “He looked at my face and he said, ‘You don’t belong here. What are you doing here?’” Perez said. The man helped her escape and Perez moved to the U.S., where she now spends her Friday nights with a group of women reaching out to trafficking victims on the South Side of Chicago. The Chicago Dream Center takes the victims in and offers them counseling, classes and a place to stay to help them find a stable job and a home. Event organizers said they held the discussion because they wanted to help show that the recent kidnapping of more than 200 girls in Nigeria is part of not only an international issue but one that affects individuals closer to home as well. Communication junior Maya Collins, a member of Delta Sigma Theta Sorority, Inc., said she hoped the event would help inspire students to bring attention to the problem on campus. Morse stressed that anyone, regardless of their skill level, can get involved in fighting trafficking and encouraged college students to reach out to their peers to join the effort.